Email marketing 5 things you are doing wrong! Email marketing is a really essential way to promote products and services. However, many business owners attempting to reach out to their customers via email struggle to achieve great results. Your campaigns may not generate results due to a few common mistakes in your email marketing strategy and execution. Some of these mistakes happen because they are counterintuitive. Others because email works differently than other marketing channels. However, the fact is, email marketing works. To help you save your email marketing from common struggles, here are five mistakes you may be making and a few suggestions on what to do to instead. What are they doing wrong? 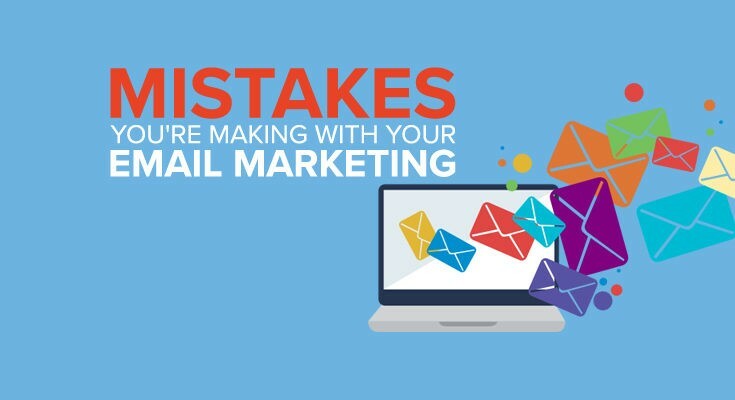 Keep reading to learn more about the 5 most common mistakes in an email marketing campaign! Before you even start typing away, it’s really important to get to know your audience and come up with a message that will engage and inspire them. 2) Underestimating the importance of your headline. Many people fail to realize that a good headline is the most important part of any email. Without a catchy, attention-grabbing email, you won’t be able to attract your readers and prompt them to click through. If you bombard the inbox folders of your subscribers with too many emails, you might annoy them, and lose their interest! Many people forget to include a final call to action at the end of their emails, as well as contact details, links, and other important information. Not including a “CTA” at the end of an email, is like telling the first half of a joke…without revealing the punchline! It simply doesn’t make sense. 5) Creating overly long emails. To put it bluntly, people don’t really care about commercial emails. Let’s face it, who gets really excited about receiving an email from a business? This is the reason why you have to work twice as hard to grab the attention of your readers. One of the best things you can do is to keep your message short and concise. If you use email marketing software such as EMMA, you will be able to tailor your emails to perfection, and save time, money and efforts while reaching more people. You will make mistakes.The key is to be aware of them and ready to solve them using the tips in this post.